Dental crowns are prosthetics for your teeth. Crowns — or dental caps, as they’re called — become a permanent part of your teeth and require the same care you give your other teeth. Go to a Yonkers dentist open on Saturday and Sunday, and you’ll find the dental crown cost is just as reasonable as other dentists, but you may be able to have it put in place sooner. Stainless steel. Usually, these are only temporary, but they’re virtually indestructible. Other metals. Dental caps can be made from gold, platinum or base-metal alloys such as chromium, cobalt and nickel. They withstand biting down hard, last longer than many other materials and don’t wear down. Porcelain fused to metal. These dental caps match the color of your teeth. However, they can chip or break more easily. Because they look more like regular teeth than any other type, they’re often used when your front teeth need capping. All resin. These dental crowns are a cheaper version. They don’t last as long because they can wear down over time, but while in place, they look and function perfectly. All ceramic or all porcelain. Dental crowns made of ceramic or porcelain look as much like your natural teeth as the porcelain fused to metal ones. They’re perfect for people with metal allergies. Temporary crowns are made quickly in the dentist’s office. Permanent crowns are made in a dental laboratory, fitted from a mold of your bite. Temporary caps are made from either acrylic or stainless steel and are used for a little while until your dentist is done creating your permanent ones. Porcelain obviously costs more than stainless steel. Back teeth, your molars, are bigger than your front teeth and so are more expensive. Additionally, you may want a tooth-colored cap for your front teeth, which is also more expensive than metal. Dental crown costs can be expensive, but they are a durable dental appliance, and your dental insurance may cover most of the cost. Your dental crowns last longer when they’re made of strong material and they’re installed properly. On average, stainless steel and all porcelain crowns last the longest, potentially for the rest of your life with proper care. Resin crowns last the shortest time because they’re subject to wearing down. Ceramic dental caps generally last 10 years or more; some have been known to last as long as 20 years. You do have to care for your dental crowns to get them to last to their full potential. Porcelain fused to metal caps are prone to chipping. Sometimes, a crown may come loose or even fall out. If it does, don’t lose the crown; your Yonkers dentist can often cement it back in place. Make a dental appointment as soon as possible. Your dentist open on Saturday may be able to accommodate you, and a Sunday dentist appointment also may be available. When you have tooth pain, you need to see a dentist right away. If you don’t visit your dentist as soon as you start noticing problems with your teeth, those problems will get worse. Once your pain increases, it’s likely due to an infection, and that means you need to take antibiotics before you can undergo dental treatment, such as having a crown placed. 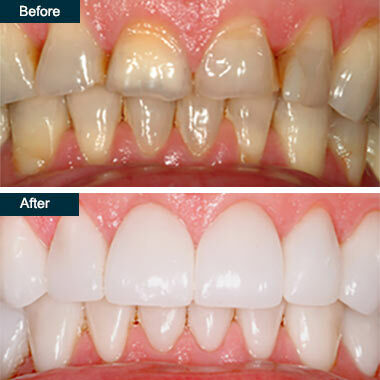 Do you have any questions about the Dental Porcelain Crown, Teeth Crowns (ceramic, zirconia) in Yonkers, Westchester NY? For more information or to schedule an appointment with the best cosmetic dentist of Park Avenue Smiles dentistry center please contact our dental clinic for consultation.